Another nail biter from the M's in what is known to be a pitchers duel every time the Mariners and the A's face off. Felix was winning the battle easily through the first 7 innings. The Mariners got on the board first in the second inning after a Dustin Ackley single and a stolen base. Oakland A's catcher, Kurt Suzuki overthrew the ball into center field and that allowed Ackley to get to third. Peguero followed with a shallow fly ball that scored Ackley for the games first run. The next run came in the top of the seventh when Ackley took the first pitch that he saw over the center field wall for his 3rd homerun of the year. That would give Felix a two run cushion as he came out to pitch the 8th inning. With two outs in the 8th, Kurt Suzuki hit a homerun to bring the A's within 1. In the top half of the ninth the Mariners had an opportunity to score again with one out and two runners on. Once again an opportunity that they couldn't take advantage of as Olivo and Peguero both struck out to end the inning. Brandon League came on for the save in the ninth and gave up a leadoff double to Jemile Weeks who was sacrificed to third by Scott Sizemore. Coco Crisp followed with a bloop single that just barely escaped the grasp of Carlos Peguero who came sliding in. Weeks, who has tremendous speed, had no problem scoring from third base. Mariners 2 - Athletics 2. Top of the tenth, the Mariners got right to it. Franklin Gutierrez had an awesome at bat, fighting off pitch after pitch before singling up the middle. Halman came up and failed at bunting him into scoring position and went down on strikes. Gutierrez took it upon himself and stole second with Ichiro at the plate. With that, A's manager Bob Melvin decided to intentionally walk Ichiro to face Brendan Ryan. It proved to be the best decision as Brendan Ryan grounded a double play ball to second base. Ichiro slid wide of the bag and caused Jemile Weeks to throw off line as the ball passed first baseman Connor Jackson. Gutierrez was able to round third and score the go ahead run as Brendan Ryan advanced to second. 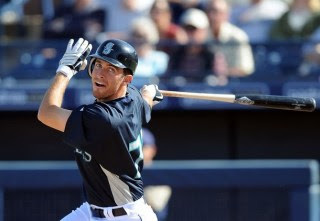 The following hitter, Adam Kennedy followed with an RBI double that put the M's up 4 - 2. Bottom of the tenth, Jamey Wright came in for his first save opportunity in his 13 year career and made it look as though he had made a career of it. One, two, three and that was the ballgame. M's win 4 - 2 and get back to the .500 mark once again. The worst thing about the game of baseball, Brandon League will get the win. Felix gets another no decision after another awesome performance but Brandon League gets a win? That has to be the worst baseball stat in the history of baseball stats. Happy with a win and even more happy to stay just 2.5 games out as the Rangers and Angels both won again. We just simply pushed the A's back to 8 games out and won another series with our win today. See you again tomorrow.